Aster root (Ziwan)-Aster tataricus L. f.
Botanical Name: Aster tataricus L. f.
Part Used & Method for Pharmaceutical Preparations: The roots, or rhizomes, are dug in spring or autumn. Then they are cleaned, dried in the sun and cut into pieces. Properties & Taste: Bitter, sweet and slightly warm. Functions: To resolve phlegm and stop cough. Indications & Combinations: Cough: a) cough due to invasion by exogenous pathogenic factors manifested as cough with profuse sputumAster root (Ziwan) is used with Schizonepeta (Jingjie) and Swallowwort rhizome (Baiqian); b) cough due to deficiency of the lungs manifested as cough with scanty sputum or with bloody sputum. 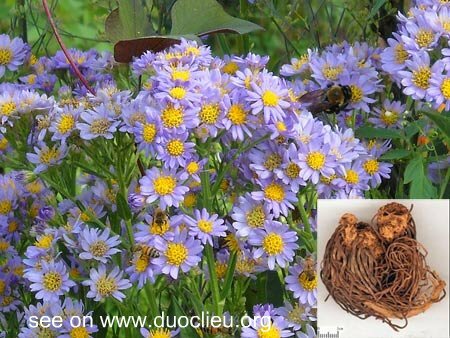 Aster root (Ziwan) is used with Anemarrhena rhizome (Zhimu), Tendrilled fritillary bulb (Chuanbeimu) and Donkey hide gelatin (Ejiao) in the formula Ziwan Tang.